Fried rice is a popular component of Asian cuisine. It originated as a home dish from China around 4000 BC, generally made from cold leftover rice fried with other leftover ingredients. Later it became a more elaborate dish, made from fresh ingredients, and often served as the penultimate dish in Chinese banquets (just before dessert). There are dozens of varieties of fried rice, each with their own specific list of ingredients. 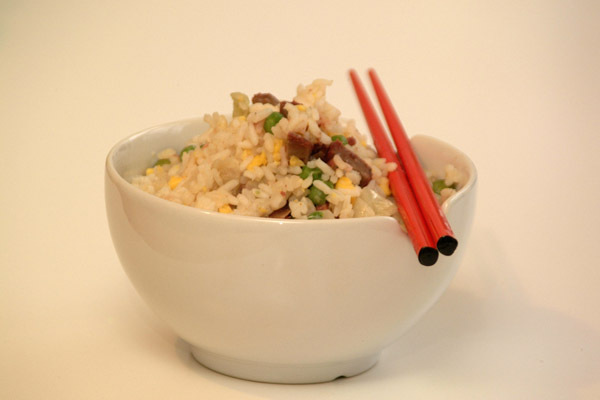 In Asia, the more famous varieties include Yangzhou and Fujian fried rice. In the West, Asian restaurants catering to non-Asian clientele have invented their own varieties of fried rice including egg fried rice, Singaporean (spicy) fried rice (which is actually not generally available in Singapore) and the ubiquitous 'special fried rice'. Ingredients used in fried rice are very varied. They include vegetables such as carrots, bean sprouts, celery, peas, and others, as well as meats such as chicken, pork, shrimp or spam, or possibly alternatives like tofu. Often cooked in a wok, it includes vegetable oil or animal fat to prevent sticking, as well as for flavor. Bits of egg provide color in many dishes. Chilli or chilli sauces often add a piquant touch to this dish or are offered in a small dish separate to the rice. Many cooks season the fried rice with black pepper. Soy sauce gives fried rice its brown color and salty taste. Often, onions and garlic add complexity and extra flavor. It is popularly eaten either as an accompaniment to another dish or, alternatively on its own as a course by itself. Popular garnishes include fried shallots, sprigs of parsley, carrots carved into intricate shapes or sliced chilli sprinkled on top of the heaped rice. Many foodstands found on the streets across Southeast Asia will serve fried rice on the spot expecting the customer to choose which garnishes to add.